Posted by Tantumblogo in awesomeness, Basics, Ecumenism, General Catholic, Glory, Grace, priests, religious, sanctity, Society, Tradition, true leadership, Virtue. “I went to live in Spain for the college “Junior Year Study Abroad” program. I was raised Protestant (though 3 of my 4 grandparents were Catholic), but I did not like religion much, and really didn’t care one way or the other about Catholicism — about which I knew nothing. 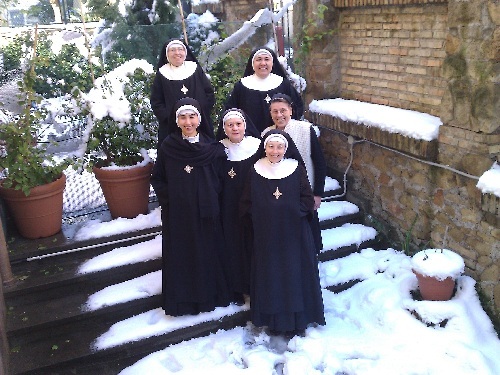 I visited Rome during my Christmas break, and became completely mesmerized by the beautiful nuns in full black habits who seemed like angels to me. I was at the point of making a very big decision in my life. I was deciding, at the age of 21, that I did not need God. I never had felt any closeness to Him, and I believed it was time for me to decide whether or not I wanted God in my life. I decided, “no I did not.” Still I loved the nuns. A few weeks later I found myself — traveling alone — in a train station somewhere outside of Madrid late one night. I had travelled out of this station a few days earlier and had boarded the wrong train because the trains came flying in, stopped for a few seconds, then disappeared into the night. I nervously watched the trains come and go, trying to understand the staticky Spanish over the P.A. system announcing each train. Suddenly two beautiful nuns came up to me and asked me where I was going. I said, “Madrid.” They said, “We are too. Come on.” They each took my by the arm, one on each side, and whisked me onto the right train. We arrived in Madrid in the middle of the night.The train station was full of a lot of scary-looking men, but the nuns held on tight to me as we sailed past. I was amazed to see those rough men cross themselves at the sight of these two holy women. The sisters saw me to my destination – at 3 o’clock in the morning. Simply wearing the habit of one’s God-given vocation can make a huge difference in the lives of people outside the Church. They see that cassock or that habit and they know they are seeing something beyond them, beyond normal experience. It makes me sad when priests only wear their “clerics” around church, and doff them at the earliest opportunity. 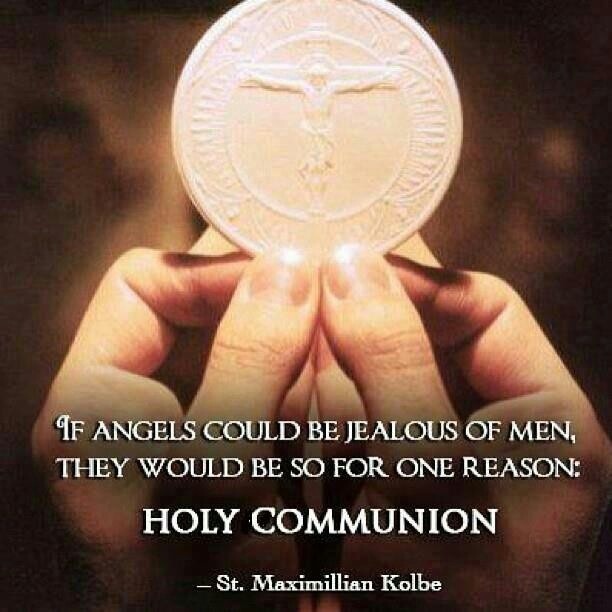 And it makes my heart sing when I see young priests in cassock and biretta, giving public witness to our faith. We need much more of that. Fr. Carota has really been on a roll of late. Here and here are two more really good posts you should read. I should really take up a Novena for Fr. Carota. Speaking the Truth so plainly, hitting so many of the forbidden topics and outrageous hypocrisies of the post-conciliar Church, I fear the hammer will fall on him at some point. Great story about the nuns. I’ll keep Father Carota in my prayers. A bishop has come done on a blogger (Protect the Pope) a deacon’s wife. I saw a link in the comments on Creative Miniortiy report. I read Fr. Carota every day. He is wonderful! And thanks for the pictures, some of which are of the beleaguered Franciscans of the Immaculate who always wear their habits. 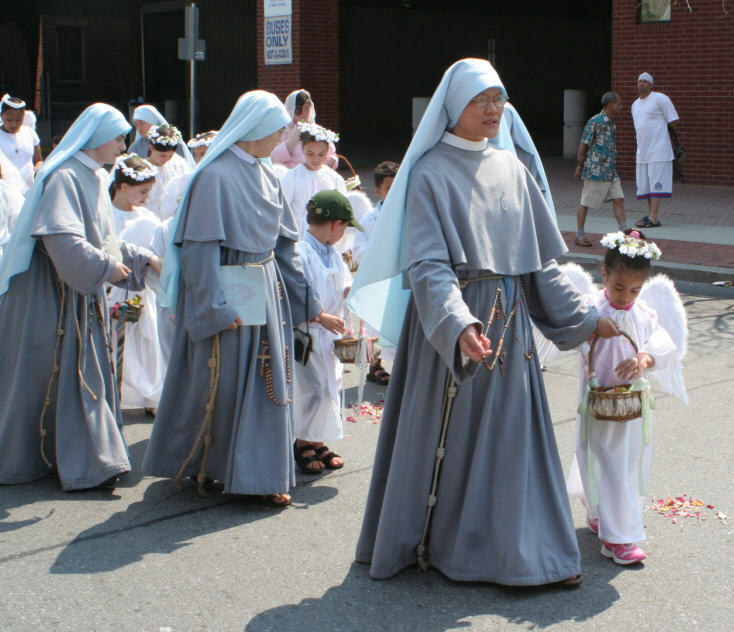 How we need the witness of clerics and habits in our world! Yes, l did that deliberately. The seeds of conversion were definitely planted in me by nuns wearing habits. I spent a college year in Spain and travelled to Rome during my Christmas break. I was very moved by the nuns in habits (something I thought no longer existed). I thought they looked like angels. I was at a crossroads in my life and was consciously making a decision about whether or not I needed God in my life. I noticed all the young people around me who didn’t seem to need God, and I had never been crazy about religion in the first place. So I did decide that God was not important, if he even existed. A few weeks after seeing the nuns in Rome, I was traveling alone by train in Spain. I was at a very confusing train stop outside of Madrid at which I had caught the wrong train a few days before, and ended up In the wrong town. I didn’t want to make the same mistake, and I must have looked very confused as I stared at the train schedule because two nuns dressed in full black habits approached me, asked where I was going, then each took me by an arm and they got on the train with me. We arrived in Madrid at 2 a.m. and the station was full of all kinds of seedy-looking characters. But those nuns stayed on each side of me as they accompanied me to my next train — the seedy-looking characters crossing themselves as we went by. After going back to the U.S. I started hanging out with a very wild bunch of friends — drug addicts, punk rockers, etc. definitely not a Christian crowd. But I always carried a fascination with nuns, and kept a collection of nun dolls, nun puppets, whatever I could find with a nun on it. Years later, I finally did discover he Catholic faith, and I was ready to embrace it after seeing how dark life was without God. I sometimes wonder how I would have reacted if I had ever seen a Traditional Mass in those drugged up, punk rock days. I know I would have been absolutely blown away by its mystery and beauty, even if I hadn’t understood it. It’s a good thing I never went into a Novus Ordo Mass. I was at the time trying to get as far away as possible from happy clappy evangelical Protestantism. I would have been sorely disappointed by the N.O. Mass! Now’s it being edifying all over, so thank you! You want me to fix it? That’s an awesome story! But I did notice some differences. I did say 2am in one and 3 am in the other. I’m not sure which it was. 2:30? What other differences did you notice? I did write a better story (vocabulary-wise etc.) to Father Carota then I left here in the comments. Let me know what else you found. At Sacred Heart Books and Gifts, we could always tell the customers who were priests on their day off- they were wearing black pants. If no one can tell you’re a priest, they can’t ask you for help.